The All Blacks may have courted glory and married failure but for this Latin lover, the romantic quest signified just why Union is the game he loves. While many may have grave fears for the sport, Felipe Contepomi offers a differing perspective. Rugby may be experiencing something of an existential crisis these days - north and south, on and off the field - but try telling that to the man sitting in the front room of a south Dublin home last Saturday morning. From Geordan Murphy fulminating against the action going "too PC", ongoing decline in Australia as well as another weekend of indifferent PRO14 fare struggling to command wider public attention, rugby seems to be getting it from all quarters of late. 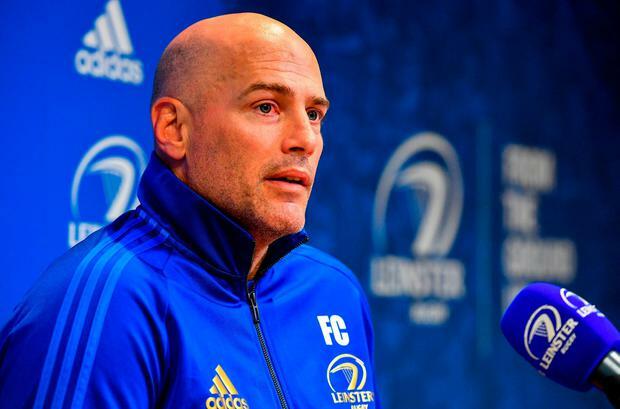 But for Contepomi, Saturday served to remind him of what the game can really be, from his morning armchair view of a thriller in Wellington to an evening perched in the coaching box at his spiritual RDS home as his Leinster side raced in seven tries. "For me, it's not about winning," he says. "It's about how you win. And how you lose." New Zealand's loss has been analysed extensively because such events are rare; Contepomi was taken not by the nature of the defeat but the manner in which they attempted to win even if coach Steve Hansen has admitted his side should have dropped for goal in the final play. "Maybe some coaches give instructions, some maybe not. I don't know what they are trying to achieve, if they are trying to achieve something different or if it's the way they want to win. But it's how you win and lose. "And that 'how' is the big question mark of what they were trying to achieve. Maybe they are reviewing the game today and wondering what the hell were you doing? Maybe they are asking the same questions you are." Some feel the All Blacks, with the Rugby Championship already secured, were merely testing their abilities under pressure a year out from the World Cup; better to fail now with the comfort of a security blanket. "Well, maybe that's why," he agrees. "That's what I mean in what they are trying to achieve. Maybe for them there was a bigger picture in trying to show themselves if they could win it physically up front. But I don't know, I'm not in their set-up. "But you can't judge them for their decision, they know exactly what they wanted and what they were looking for. It's harsh, that's one thing. "How can you be the hero one day and next day the failure? It goes like that in this sport. I still think Beauden Barrett, at his peak is with Johnny Sexton, the best out-half in the world." But would the Irishman have dared to venture where Barrett seemingly feared to tread, and tried the drop? "Yes," he smiles. "And with his left peg!" For the most part, the southern hemisphere clash of giants demonstrated the best of the sport; Argentina's win on the Gold Coast was obviously something else for the former Puma to cheer but the ongoing wrangles about potentially dangerous tackling continues to rankle with some. Some fear that rugby's belated attempts to compensate for years of ignorance about the causes and effects of concussion may irretrievably change the game for ill; again, Contepomi, as he so often did on the field, dares to differ. "For what I think, rugby is a great sport and we need to keep it as safe as possible. "We need to judge around the welfare of the players and if that is the way they are managing it, I don't know, we'll see later on. "It's physical enough. Players are getting stronger, faster, leaner. It's even hard to find space on the pitch. "I don't know why Geordan said what he said. Maybe he has said a reason why. It is his comment. "From my point of view, keep it as safe as possible. It is a great sport." And, when the game negotiates its way out of the current judicial and officiating mess, the Leinster coach believes it will be in a much better space - and with more space to play it in. "It's already getting that way. It's not only about fighting or being physical. You need to be very skilful to find those places. "Now, you can see stepping into full-backs or wingers. Maybe it was unusual 20 years ago. "If I bring you all the 50 Leinster players, you might not be able to tell which position they are in because everyone looks the same. "Twenty years ago, you would say, 'that's front five, middle five'. For me, rugby is going in the right direction. "Nothing is ever perfect. But it is moving in the right direction, in my opinion."